What's the next best thing to owning a Ferrari 458 Italia? Forget it, you can't afford her. 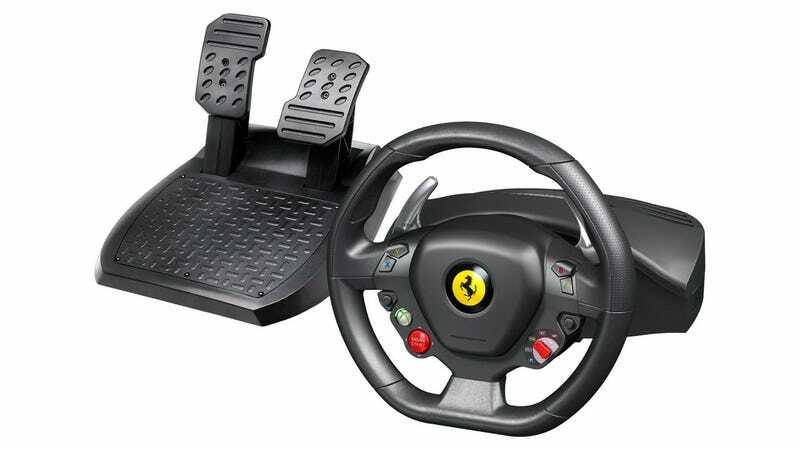 But a few things down from that is this: a replica 458 Italia steering wheel for XBox. The wheel is fully Ferrari-licensed, so you won't have to worry about thugs from Maranello appearing at your door with "papers for you to sign." It even has a Mannetino knob, which in Forza 4 can modify in-race settings like changing player views. (Or you can turn off the game and just play make-believe by selecting race mode before heading over the Stelvio Pass with Marika Fruscio in the passenger seat.) And the best thing? You don't have to buy a used one first before the dealer lets you buy a new one. The Thrustmaster Ferrari 458 Italia Racing Wheel for Xbox 360 will be out in October at a suggested retail price of $89.99.